We are offering a wide range of 5 Pieces Bathroom Accessories Set (Thor Series). This product makes the way to fulfill customer need as it helps in wide range of Rio Series Hook with different measure 3 hook, 4 hook, 5 hook, 6hook. Ss Towel Rod 12" To 30"
We are dedicatedly engaged in Manufacturing and Supplying a commendable range of SS Liquid Soap Dispenser. We are offering cube series of SS Liquid Soap Dispenser. 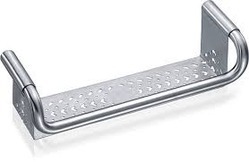 We are engaged in providing a qualitative assortment of SS Bath Accessories that is used in various application areas. Our product impart a splendid look to the bathroom and known for their long time superior functionality. Our company stocks the product in mass. Thus, we can cater to bulk/retail requirements with easy and ensure fast delivery of product. 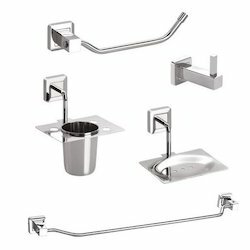 Defined as one of the celebrated names in the market, we are involved in offering excellent quality Stainless Steel Bathroom Accessories.